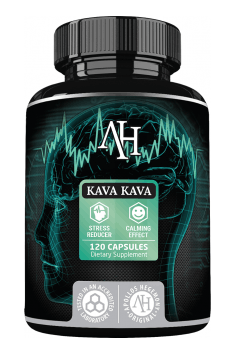 Apollo's Hegemony Kava kava is a dietary supplement containing a standardized extract from kava kava – plants with proven anxiolytic, calming, and sleep-conducive effects. Kava kava, or intoxicating pepper (Piper methysticum), is a species of shrub growing in a tropical climate. Kava kava used to be traditionally consumed in the form of a brew with a specific taste during meetings and ceremonies due to its relaxing effect. It was also widely used for medicinal purposes. Currently, thanks to its unique properties, the plant has also gained interest within the world of science. The main active compounds of piper methysticum are the kavalactones present in the roots of the plant, amongst which there are metisticin, kavain, yangonin, and their dihydro derivatives. The kavalactones show primarily anxiolytic, sedative, and relaxing effects. The mechanism of action of kava kava has not been yet clearly explained. So far, it has been possible to establish the affinity of kavalactones for GABA-A receptors and their ability to reversibly inhibit the activity of monoamine oxidase B (MAO-B). Kava kava is also believed to have an effect on noradrenaline reuptake. Kava kava helps to relieve the symptoms of panic attacks, such as palpitations, irritability, or tension pain. In studies with the participation of patients suffering from anxiety disorders, it was shown that kava kava exhibits anxiolytic activity. The Hamilton scale (HAM-A) showed the improvement and stabilization of the emotional state, as well the increase of concentration of the subjects. Importantly, kava kava reduced anxiety without adversely affecting cognitive functions; it was well-tolerated and did not cause addiction. Research with the participation of kava kava showed that it was an effective agent in facilitating falling asleep. The plant is especially helpful in sleep disorders caused by fatigue of the body. In animal studies, it was proven that kava kava also improves sleep quality – there was a positive effect of the plant extract on the activity of delta waves during the NREM phase of sleep. Another advantage of kava kava as a facilitator of falling asleep is that it does not cause tolerance and the so-called rebound effect, that is the withdrawal insomnia, characteristic of many sleeping drugs. In addition to relieving nervous tension and insomnia, kava kava has a number of other properties. It shows diastolic, antibacterial, and diuretic effects, thanks to which it is helpful in ailments of the urinary tract. Kava kava relieves the symptoms of menopause, including hot flushes and mood swings. In addition, the active ingredients of the plant have an analgesic and anticonvulsive effect. In summary, Apollo's Hegemony Kava Kava is a preparation containing plant raw material being a valuable alternative to other sedatives and facilitating coping with excessive stress. The product is recommended especially for the relief of emotional tension, adjuvant in neurotic conditions, problems with falling asleep, as well as in inflammations and infections of the urinary system and to relieve the symptoms of menopause. Take 1 capsule 1 to 3 times daily, with a meal. It is best to take the preparation before bedtime. Do not use for more than 4 weeks. In order to increase resistance to stress, it is also worth enriching your diet with B vitamins, magnesium, and calcium, and to ensure sleep hygiene. If you are taking any medicines, consult your doctor before the use of the supplement. Avoid drinking alcohol while supplementing kava kava. The product must not be used in children. Kava (Piper methysticum) - a species of traditional medicinal plant commonly known as kava or kava kava; used for thousands of years for medicinal purposes and relaxation in the countries of the South Pacific by drinking the brew, cooked-from fresh rhizomes, or more often - from the root. It is the root contains many active substances with a slight psychoactive, spasmolytic and anxiolytic, i.e. Kavalactones (mainly methysticin, yangonin, kavain, marindinin and their dihydro-deriavatives). Despite this is not qualified as addictive drug. The mechanism of action of this plant is complex and not entirely understood. At the moment, it is known that Kava works by GABA-A receptors nerve ends stimulates the secretion of FSH (follicle stimulating hormone), inhibit monoamine oxidase activity in the brain, i.e. enzyme degrading lots of neurotransmitter having the structure amine. Many clinical studies have confirmed anxiolytic effects, anxiolytic, anticonvulsant, sedative, calming, centrally relaxing muscles, putting the plant on a par with such medicines as opipramol and Buspirone - the comparison was made in the testing of the German drug Maoni, which included just a standardized extract of kava. Moreover, scientists study the operation of the plant for the suppression of the symptoms of menopause in women. Kava - like many users are reporting - can cause slight euphoria, enhance mood and stimulate eloquence. It creates a state carefree, retaining the brightness and sharpness of mind and the ability to concentrate attention, which is a much better option than drinking alcohol. In addition, unlike alcohol, does not cause aggression, anger and foolish behaviour, making it a potential mean against addiction. It is recommended that the use of kava in the states of fear, anxiety, increased tension and emotional symptoms nervous-anxiety. Researchers in 1990 studied the effects of an extract of Kava Kava for anxiety and some vegetative symptoms among women (approx. 52 years of age) undergoing menopause. Treatment lasted 12 weeks, the dosage was 60 mg per day kavalactones. Using a specialized index (KI - Kupperman index, ASI - an index of anxiety) reported beneficial effects of therapy after 4 weeks of starting supplementation. Subsequent studies also confirmed the effect of reducing anxiety. Furthermore, kava showed a synergism in combination with hormone replacement therapy (HRT), including the use of estrogens and progestogens.